101st Devil While the battle to determine the next king of the demon realm has often been fraught, the rules were always clear: 100 demon children partnered with 100 humans would challenge each other, using 100 magical books. What none of them knew was that there was a 101st magical book, powerful enough to stop any of the others. Gash and Kiyomaro must begin a journey that will take them into the demon realm to confront the mysteries of Gash’s past. But will they escape in time to help their friends in a battle with a seemingly unstoppable enemy. 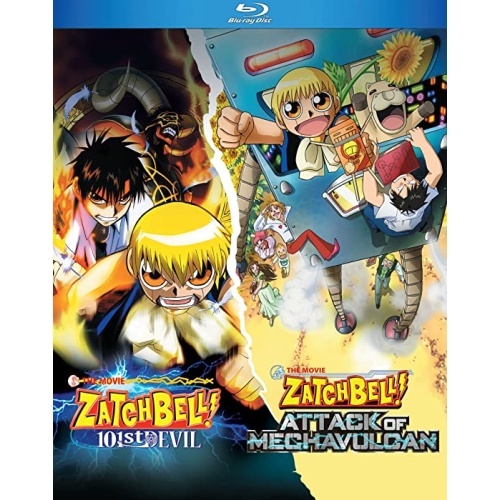 Attack of Mechavulcan As Kiyomaro races to catch the bus to seaside camp, little does he know that Dr. M2, a demonic magic scientist from the future, has sent out a robot to kidnap him. He's trapped in limbo with the mad magic scientist who wants to be his partner and an army of Vulcan robot lookalikes. Dr. M2 sends a robot to pretend to befriend Gash, keeping him away from Kiyomaro until M2 can abscond with the teen genius to the future. In the end, it comes down to saving the world with a little help from their friends... Includes the original Japanese with English subtitles!